Inclement Weather Policy: In the event of inclement weather, the race will be held on the chosen snow date. If that is not feasible, it will be held on the earliest date available that will be safe to hold the race. Runners will have the option of deferring their entry until the following year. 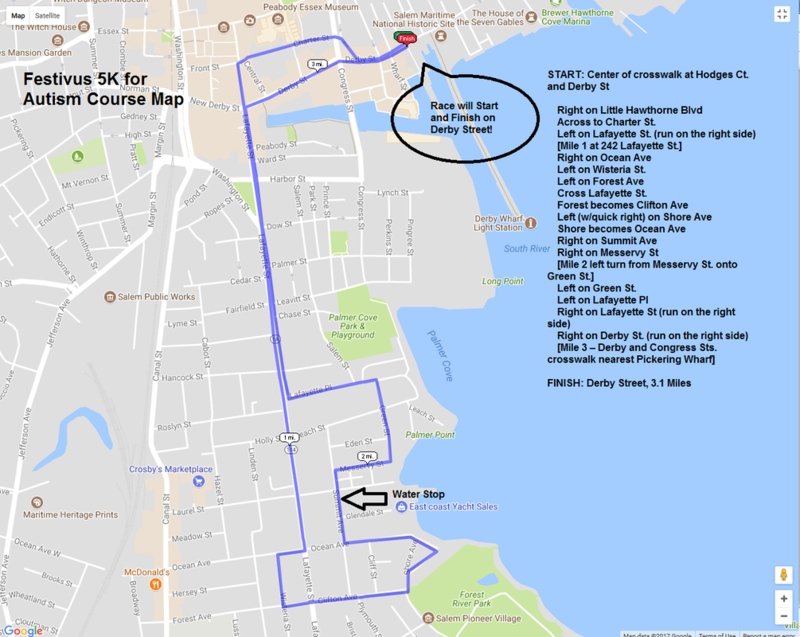 Location: Race day registration is at Finz Seafood & Grill 8:30-9:45 AM at 86 Wharf Street in Salem. Race start is on Wharf Street. Parking: Public parking available in lots, garages, and on streets. Course: Fast course with one water stop. Entry Fee: $25; $30 on race day, which includes a post-race party for runners at Finz Seafood & Grill. It will include a light buffet and refreshments. The awards ceremony and grievance and costume winners will be announced at this time. Shirts will be given to the first 400 runners. Timing: Timing by North Shore Timing Company. Results will be texted to runners and posted on timing company website. Packet Pick Up: New England Running Company, 43 Enon Street, Beverly, MA on Saturday, December 8, 2018 from 9:30-4:30. Awards: The overall male and female winner will receive a Festivus pole trophy. Awards will also be given to the top three finishers in the following categories: Male & Female, Youth 13 and under, Youth (14-19), 20-29, 30-39, Masters (40-49), Senior Masters (50-59), (60-69), (70 and over). Will your team win "The Wiz" award? Nobody beats the Wiz. Nobody. This team award will be given to the top overall team. The top 3 team members will be scored cumulatively and at least one team member must be female. A Best Costume award will be given to one male and one female participant. To participate in the contest, appear at the judge's table by 9:30 AM on race day. Your costume must be holiday- or Seinfeld-themed. Judges will award prizes for the top 10 grievances. New for 2018: Izzy Mandelbaum Push Up Challenge--all aboard the pain train! This trophy will be given to the male and female who have the most number of push ups completed in one continuous set. Registration for the push up challenge will be $10 at the event. Izzy Mandelbaum Push-Up Contest (new in 2018)! If you want to prove you're no butterbean, take part in the Izzy Mandelbaum Push-Up Challenge. 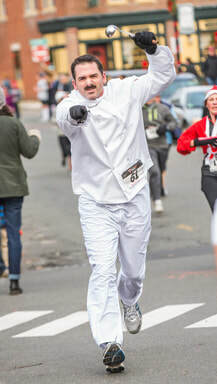 Sign-up for $10 at the registration table on race day, find a partner to judge your push-ups and form, and say "It's Go Time!" The overall male and female winners with the most push-ups in a single set win the Challenge trophy and are Number 1 and the World's Greatest.